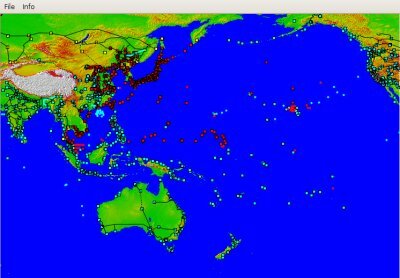 The Pacific War Online Encyclopedia originated with a project to develop the ultimate killer Pacific War computer simulation. The software didn't get very far before the Encyclopedia took on a life of its own, but for your amusement I offer some of the software I have developed. pwol-platforms.dtd: This contains a document type definition for structured documents (suitable for machine processing) describing the various ships and aircraft that fought in the Pacific War. A software bundle for reading these files is also in the works and will be released as a tarball when I feel it's ready. All this material is provided under the GNU Lesser Public License, which is meant to make it freely available to all wargamers without infringing excessively on the ability of any wargamer to market any game he develops. These files are meant to provide raw material for computer simulations, and I don't really expect them to be directly useful for wargaming. For example, the ship descriptions include rather detailed descriptions of armor protection schemes that will have to be processed and converted to more abstract representations of resistance to damage before they will be of much practical wargaming use. Most ships of the Pacific War received periodic upgrades, particularly to their antiaircraft batteries, directors, and radars. These are a bit problematic for wargaming, particularly since the modifications vary among units of a class (sometimes slightly, sometimes to the point where classes almost have to be split into subclasses) and since we don't know how classes wiped out early in the war might later have been modified if they had survived (as can happen in a war game.) I have therefore aimed at showing what was possible and at about what time for each class, rather than attempting to encode a lengthy and ultimately pointless (from a gaming perspective) historically complete description of all ship modifications. Note that the tarball is very large (almost half a gigabyte) because of the extensive map data included. It takes about fifteen minutes to download to my home computer via broadband. Be patient. I may provide some of the source code for this program in the future, for the benefit of game developers, but I haven't made a final decision yet on what to offer and under what license terms.